The first batch of This is the Sound of Adamsdown have now arrived and are looking good! Anyone wanting to buy a copy or take some to sell should ring (029) 20213053 or use the email address to the left. The price is just £5: sellers keep £1, or in the case of shops, £2. Once costs have been met all profits go to future community music projects. The CD should be available online shortly: since the price is set by retailers this is likely to be a little more than the physical CD, although you will be able to download individual tracks. A launch event is planned shortly. This is the Sound of Adamsdown is now in production and also submitted to I-Tunes, Amazon, Spotify etc where all being well it should appear within a fortnight. I-Tunes does not allow compilations but it will hopefully be clear that all tracks on the CD are the product of the same two musicians, with a range of featured vocalists. With the completion of the last track, Crystal Moment, a rethink of the track order became necessary, and the result can be seen in the track listing on the back of the CD. Hopefully everyone will be happy with this – the track listing is not a top ten! What is clear from the reactions of everyone who’ve heard the album is that we have a pretty good product. We’ll be organising its promotion shortly, and if anyone is interested in helping with this, do get in touch. Crystal Moment, the final song for This is the Sound of Adamsdown, is at last recorded, and following some final tweaks the tracks will now be going off to the CD manufacturer. A date for release should be set shortly. Crystal Moment, sung by Dominique Fester, can be heard at our site on Reverbnation. 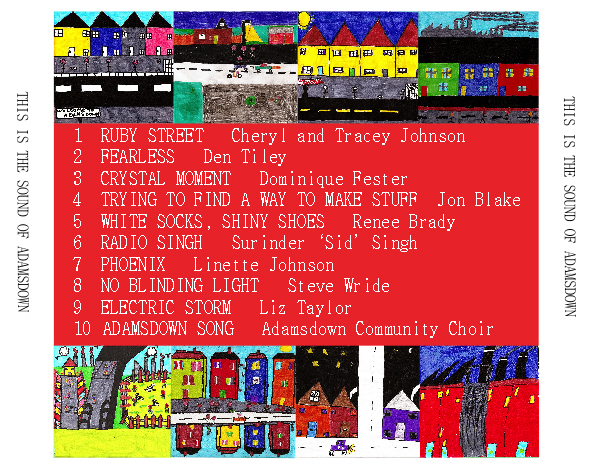 Welcome to the new site for the This is the Sound of Adamsdown CD. We’ve outgrown our old site at www.adamsdown.wordpress.com, so that site will revert to being the home of Adamsdown Song, the original project featuring the primary school pupils of Adamsdown, Cardiff. The CD is now on the verge of completion and should be ready for sale late Jan/early Feb.